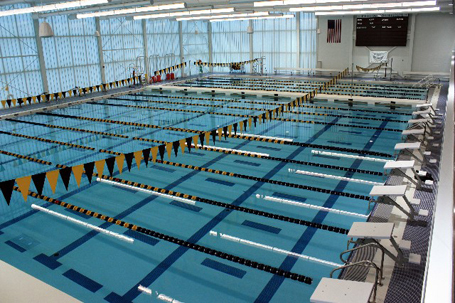 At 35 meters long and 25 yards wide with a bulkhead, the new pool at Clinton Sprout Natatorium can accommodate 15 lanes while utilizing an eco-friendly filtering system that will save thousands of gallons of water. The structure, designed by the architectural firm Hillier Group, and the pool, designed by Counsilman-Hunsaker, uses many materials and products that decrease energy consumption and deliver daylight to the building’s beautiful interior spaces. The Clinton I. Sprout Pool (the home of Peddie swimming for 37 years) boasts many Olympic swimmers, including alumni Nelson Diebel and Royce Sharp. The new natatorium provides the Peddie Falcons and other swimmers with optimal training conditions in a fast competition pool and gives the opportunity to share space with the community.